Is this a sensible comparison of cars and public transport? Many readers will have seen this now-ubiquitous chart before – it’s from Melbourne 2030 and has been republished countless times. It shows the proportion of metropolitan jobs accessible within 40 minutes travelling time from different parts of Melbourne by car and by public transport. I’ve never been happy with this chart because its simplicity is deceptive – I don’t accept the implicit premise that public transport should be judged on the same basis as cars. I’ll come to that shortly, but first there are some technical shortcomings that need to be addressed. One is that the chart doesn’t say how the data range intervals are determined – are they equal counts? Are they based on a ‘natural break’ in the way the data is distributed? It’s not possible to be confident that they portray the situation with either public transport or cars in as objective a way as possible. Another shortcoming is that a mere three categories is very limiting. If you live in Sunbury (say), the chart says you can drive to between 3% and 25% of metropolitan jobs within 40 minutes. That’s an enormous range – a factor of more than eight between the lowest and highest values. It’s essentially a useless piece of information. 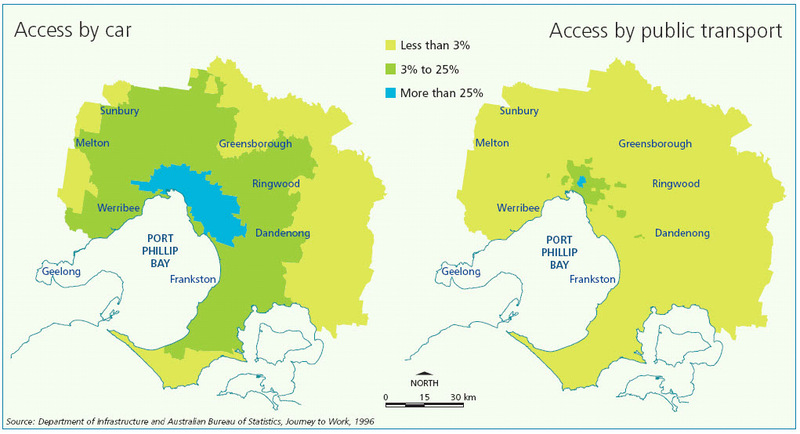 And the maps give a misleading impression of how many Melburnians live in areas with the poorest accessibility. There are very large areas on the fringe that have a tiny population e.g. there is a 9 km wide greenbelt between Melton and Caroline Springs. Much of the outer north east is a catchment area. Was Melton a bad idea? I’ve referred to satellite cities in passing in recent weeks, both those around London and our own Melton and Sunbury. They’re a once-fashionable but very peculiar idea that might get another run if recent population projections are taken seriously. So it’s worth looking at the idea more closely, particularly how it’s been handled in Melbourne. The issue I have with satellites is they’re O.K. if they have plenty of local jobs or if workers commute by public transport to the nucleus or host city, but they’re a very bad idea if neither of these conditions apply. Melton was made a satellite city in 1974. According to historian David Moloney, satellite cities were a response to “urban quality of life issues: large cities and unrelieved urban sprawl were seen as too congested, uncongenial and economically inefficient”. They were, he says, a product of the rise of the town planning profession in the 1960s. If London can really grow without expanding its urban perimeter, why did our planning Minister, Justin Madden, seek to extend Melbourne’s urban growth boundary last year? As I noted on Friday (How big is Melbourne? ), journalist Jason Dowling says that “forever outward expansion (of Melbourne) is not a necessity. London has barely touched its urban perimeter for decades but has grown in population with better use of old industrial and commercial land”.